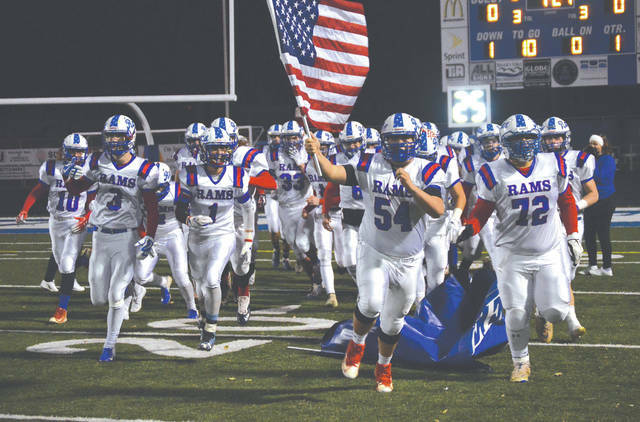 The Greeneview Rams earned the respect of the defending Division V state champs Nov. 1o, despite a 35-13 regional semifinal loss to Wheelersburg at Herrnstein Field in Chillicothe. Greeneview senior quarterback Nick Clevenger (6) finds a hole to run through, during the first half of the Division V regional semifinal high school football game against Wheelersburg, Nov. 10 at Herrnstein Field in Chillicothe. Wheelersburg’s Makya Mathews (29) had a pair of rushing touchdowns, and returned a punt 48 yards for another, while gaining a game-high 98 yards on the ground in a 35-13 win, Nov. 10 over Greeneview in the Division V regional semifinal high school football game at Chillicothe’s Herrnstein Field. CHILLICOTHE — Moments after his team’s 35-13 win over Greeneview, Wheelersburg defensive line coach Chad May walked over to Rams defensive lineman Nick Wolfe and shook his hand. Wolfe and the rest of Greeneview’s football team helped Pirates fans learn where Jamestown, Ohio was on a map. The underdog Rams were within eight points of the defending Division V state champs with less than 3 minutes left to play in Saturday’s regional semifinal high school football game at Herrnstein Field. 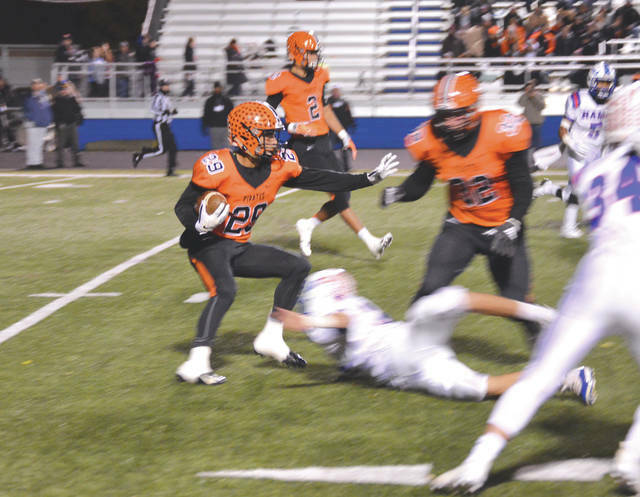 Wheelersburg had given up more than seven points in a game just twice during the regular season — a 51-20 loss to D-III playoff team Hartley, and a 33-14 win over D-III playoff competitor Jackson. Greeneview’s ground churning, ball-control offense seemed to frustrate the Pirates at times, as well. Junior running back Clay Payton unofficially gained 79 yards rushing on 16 carries. He scored on a 10-yard run to pull Greeneview within 14-10 at halftime, the Rams’ only touchdown of the game. Greeneview quarterback Nick Clevenger kept finding seam after seam inside the Wheelersburg defensive line for short running gains. 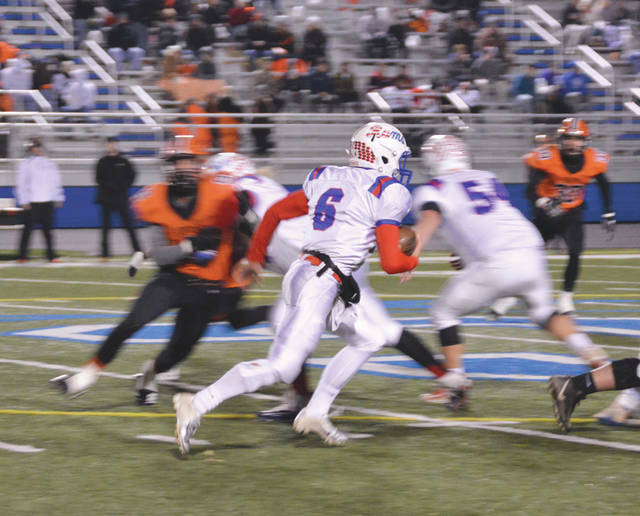 The 6-foot-1, 190-pound senior led the Rams in rushing with 92 yards gained on 23 carries. He also connected on 11 of 19 passes for 85 yards, with a pair of interceptions. “I feel pretty good. I mean, you always want to come out on top. It’s a hard loss,” Clevenger said, sounding hoarse and at times a bit breathless after a hard night of work. “Five minutes left and down 13-21, go for it on fourth down, things don’t go our way. They get the ball back and score. They’re a great football team. Great football teams make big plays. Pirates QB Trent Salyers passed for 270 yards on 17-of-25 passing, but Wolfe, Clevenger and other members of the Rams defense sacked Salyers three times for minus-9 yards, and caused a pair of fumbles, one that was recovered by the Rams. Defensive back Collin Wilson and linebacker Dakota Mangan both picked off Pirate passes during the game as well. Wheelersburg’s Makya Mathews, whom the Burgfan.com radio crew has affectionately nicknamed “Hedgehog,” gained 98 yards on the ground, scored on TD runs of 1 and 30 yards, and returned a punt 48 yards for another score. Six-foot-6 wideout Tanner Holden was the main recipient of Salyers’ passes, grabbing six catches for 134 yards. Holden is headed to Wright State University after graduation to play basketball for the Raiders. Greeneview coach Ryan Haines said the turning point came down to the fourth-down play on the Rams’ 44-yard line with just over 4 minutes left to play. The Rams came up 2 yards short. Four plays later, “Hedgehog” Mathews ran 30 yards for a score. On Greeneview’s next possession, Mathews picked off a Clevenger pass with 1:40 left. On the next play, Wheelersburg’s Evan Horsley ran right for 45 yards for the game’s final TD. “I complimented (Holden) on his game and wished him well at Wright State,” Haines said. “We had a fantastic season. (sighs) We just came up a little bit short. … Against a team like Wheelersburg, the defending state champions, you gotta play to win. We were selling out (on defense), and that’s a problem because if you don’t get the tackle, there’s a crease. Wheelersburg (11-1) advances to take on Middletown Madison (12-0) in the Region 20 title game, which will be held at 7 p.m. Nov. 17 at Hilliard Darby High School. Greeneview closes out its Ohio Heritage Conference South Division championship season with a 10-2 record.